Any little boy will appreciate cuddling up with the Boys Angel Bear Security Blanket. 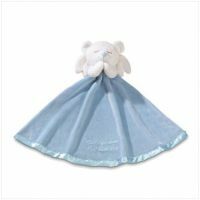 Complete with miniature angelic bear, this blue blanket is a great accompaniment to any bedtime ensemble. Made of polyester, it is warm, soft, and 100% made for snuggling.